This post was updated at 6:13 p.m. EDT. We spoke with Troy Moon of the Pensacola News Journal on the recent sprint weather storms have impacted the area. We’ll have more on the storms Wednesday night during the NewsHour broadcast. The giant storm system that violently swept across Oklahoma, Mississippi and Arkansas last weekend has evolved into widespread flooding in the Florida Panhandle and Alabama Gulf Coast on Wednesday. 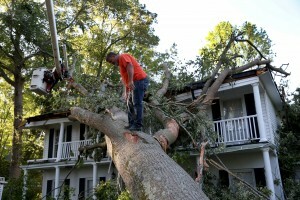 The death toll from the storms has grown to 36 so far. The National Weather Service said that as much as 22 inches of rain had fallen in Pensacola, Florida, as of Wednesday morning, with more rain to be expected throughout the day. Average annual rainfall for Pensacola is 65 inches, which means the city received one-third of that rainfall in one day. Police and crews are struggling to respond to distress calls efficiently because of heavy flooding in the area. One woman died when she drove into high waters, and more people are stranded in cars and homes waiting for rescue. Officials said they received about 300 calls for evacuation and approximately 30,000 homes are without power. This prolonged weather pattern is abnormal, according to forecasters, and the past few days marked the first time in 22 years with 10 or more tornado deaths for two straight days.